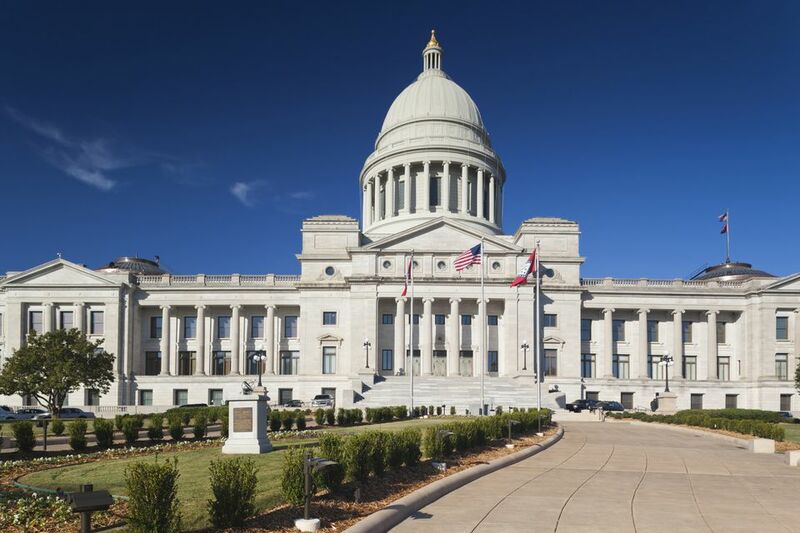 Arkansas has a rich history, and its neo-classical style Capitol building is no exception. The Arkansas State Capitol was built between 1899 and 1915 on the site of the old state penitentiary. Prison labor was used to build it. Components of the Capitol came from all over the United States including a staircase from Alabama, marble from Vermont, and columns from Colorado. Some of the limestone for the exterior was quarried near Batesville. The front entrance doors are made of bronze and are 10 feet tall, four inches thick, and were purchased from Tiffany & Company in New York for $10,000. The Capitol building stands 230 feet tall and features a circular central drum tower that is capped with a dome and cupola, which is covered in gold leaf. The building was designed architects George Mann and Cass Gilbert as a replica of the U.S. Capitol and has been used in many movies as a stand-in. The project ran well over its $1 million budget; the completed Capitol cost almost $2.3 million. Interestingly, George Mann started construction on the project and he had very ambitious plans for the Capitol and grounds. His vision for the exterior dome and grounds can be seen in reproductions of his designs throughout the first-floor rotunda. They are a bit more ornate than the Capitol's current form. The Capitol project was completed by Cass Gilbert, and he made significant changes to Mann's original designs. The Capitol serves as the working office for Arkansas' governor and many other government offices. The building houses six of seven constitutional offices as well as the House and Senate chambers. The Arkansas Supreme Court once used the building, but the courts are now located at 625 Marshall Street in Little Rock, Arkansas. You can see the old supreme court chambers and the governor's reception room on a tour of the Capitol. Citizens are also invited to the viewing areas to see the House and Senate when it is in session. Located on the grounds are several monuments including those to veterans, police, Confederate soldiers, Confederate women, a Confederate war prisoners marker, and a civil-rights memorial to the Little Rock Nine. The Capitol Building is on Capitol Avenue in downtown Little Rock. It is located at the intersection of Woodlane Avenue and Capitol Avenue. You can walk there from the River Market area, but it is better to drive. The State Capitol Building is open to the public Monday through Friday from 7 a.m. to 5 p.m. (though some sections open later in the morning), and on weekends and holidays from 10 a.m. to 3 p.m. You can have a guided tour or just walk through yourself. The free scheduled tours of the Capitol building are offered weekdays on the hour between 9 a.m. and 3 p.m. Call 501-682-5080 for more information or to arrange a private tour. The Secretary of State's website offers virtual tours of the Capitol. In addition, certain parts of the Arkansas State Capitol offer free public Wi-Fi. If you're going to visit Little Rock, you should at least see the outside of the Arkansas Capitol building. Not only is it beautiful, but history was made there. President Bill Clinton once served as governor in this building and announced his candidacy for the presidency. Short on time? Take a tour of the inside of the Old State House Museum. As the state's original state capital and oldest surviving state capital west of the Mississippi River, the Old State House Museum lets you admire the Capitol from the outside. You can check out several interesting exhibits, but the inside isn't as ornate. It's fun and free if you're looking to learn a little Arkansas history. Have you heard of Arkansas' own revolution? In the 1870s, the Brooks-Baxter War featured two politicians fighting over control of Arkansas, complete with a canon.